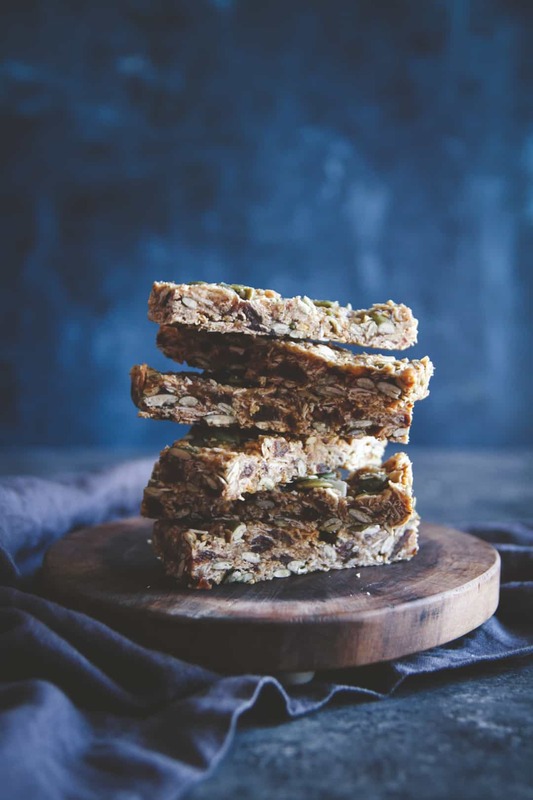 These almond butter date pepita granola bars are a healthy homemade snack recipe that you’re going to fall in love with. 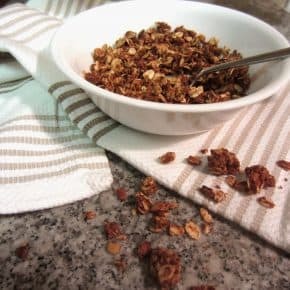 They’re naturally sweetened with toasted oats, coconut, and pepitas and make for one of the best granola bars I have ever had! 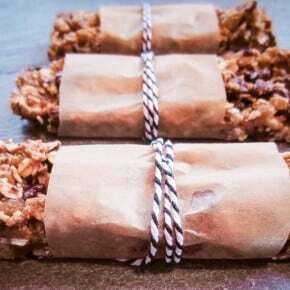 Today’s post for these homemade granola bars has a cute story behind it. So in my household, we celebrate the holidays…twice. Half of my husbands family is Serbian Orthodox (as I shared in this oil and vinegar potato salad post) and the Orthodox Christmas eve and Christmas day are celebrated later (January 6th-7th). So instead of having only one indulgent Christmas celebration, we end up having more than our fair share. Come New Years, I was really ready to start eating better. It’s something I think a lot of people can relate to. One of the problems I have is definitely having healthy snacks on hand. 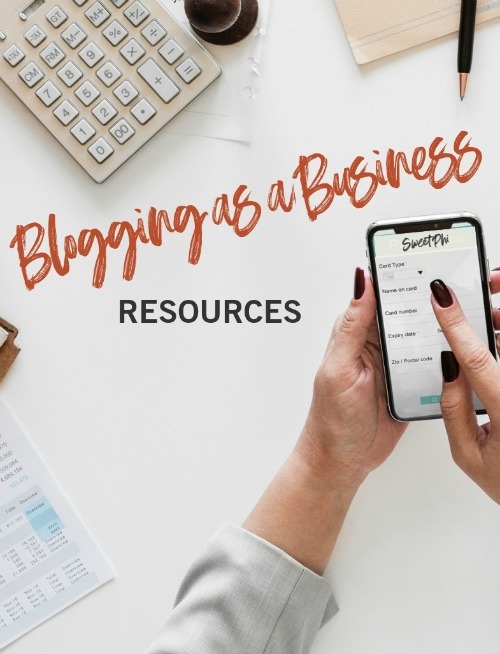 I will run out of ideas, and cutting up those carrots/celery for some hummus or something that requires prep just doesn’t work when I want something immediately. And sometimes what’s immediately in reach is not that healthy! 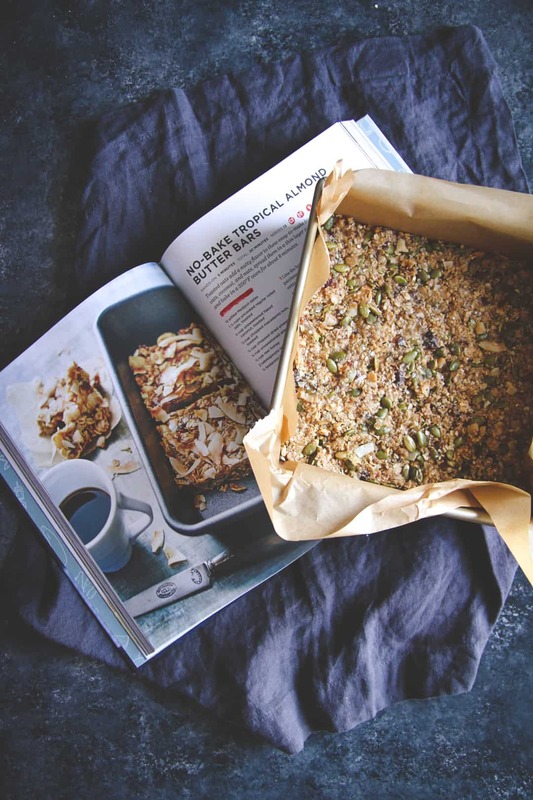 As I shared on Instagram, I was flipping through cookbooks and in 100% Real by Sam Talbot I came across this recipe for “no bake tropical almond butter bars.” The cookbook shows you how to make delicious, nourishing food using healthy wholesome ingredients. I have half of the recipes flagged for making! 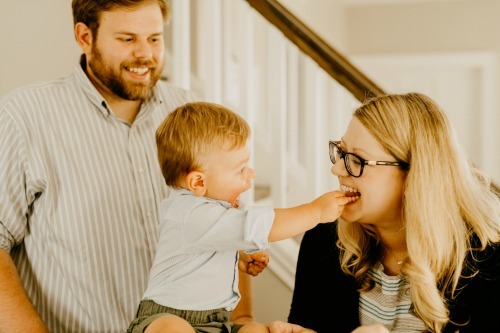 I used that as inspiration for this recipe, but I did have to laugh a little when the first step in a “no bake” recipe was to turn on the oven and toast the ingredients. So I’m not calling it a “no bake” recipe, because baking is required. 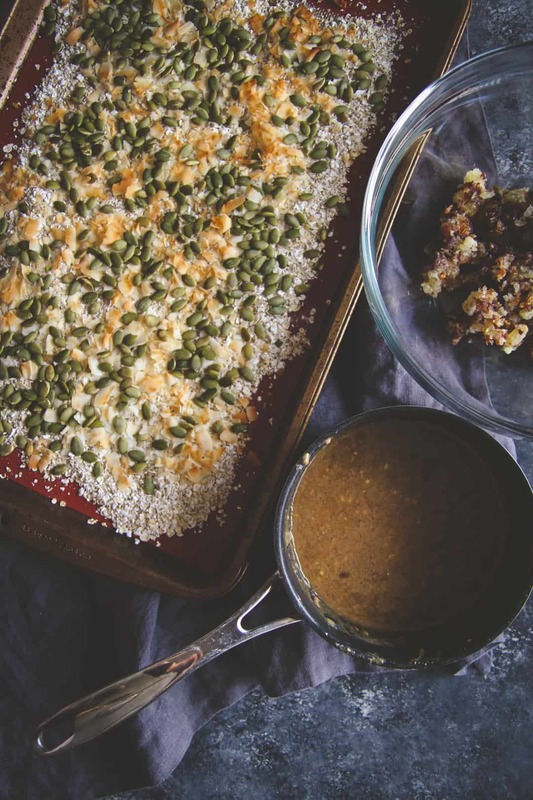 You’re going to fall in love with this recipe for this almond butter pepita date bars. It’s honestly one of the best granola bars I’ve ever had. The ingredients provide a fantastic source of natural energy and the bars are naturally sweetened by dates and dried pineapple and coconut. 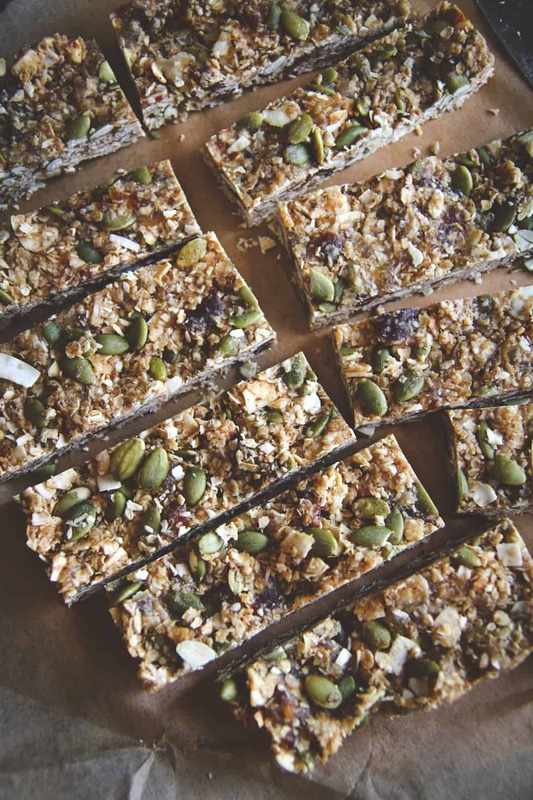 All in all, these homemade almond butter granola bars are totally worth making, and are a healthy snack I’m going to making all year long. Preheat oven to 350 degrees. Line a baking sheet with a silicone baking mat or parchment paper. 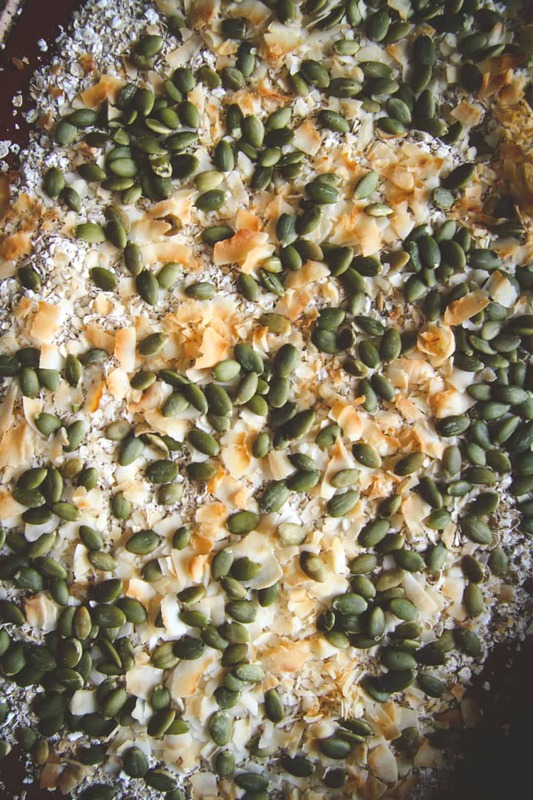 Spread oats, coconut flakes and pepitas on the baking sheet, and bake for 5-8 minutes, until slightly golden brown. Remove from oven and set aside. Line the bottom of an 8x8 inch baking dish with parchment paper, allowing a few excess inches of parchment to extend past the sides of the dish. Process the dates and pineapple in a food processor and process until finely chopped and it begins to form a ball. 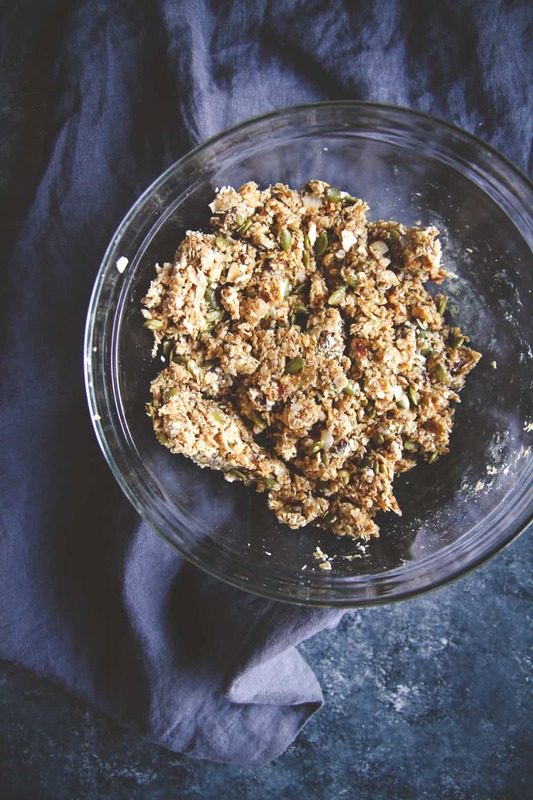 Transfer to a medium bowl; add the oats, and pepitas, stir to combine. Combine the almond butter, honey and coconut oil in a small saucepan over medium heat. Cook, stirring often, until smooth, about 3 minutes. Pour the almond butter mixture over the date mixture and stir well. Spoon the mixture into the prepared baking dish. Top with a piece of plastic wrap, and press onto the surface of the mixture. Freeze until firm, about 15 minutes. Using parchment paper, remove the frozen mixture from the baking dish, cut into 12 bars. Store in the refrigerator, good for 2 weeks. Your photography is really pretty, I’m obsessed with your blue background! I’m so happy I stumbled across your website b/c I’m challenging myself by going refined sugar-free this month. 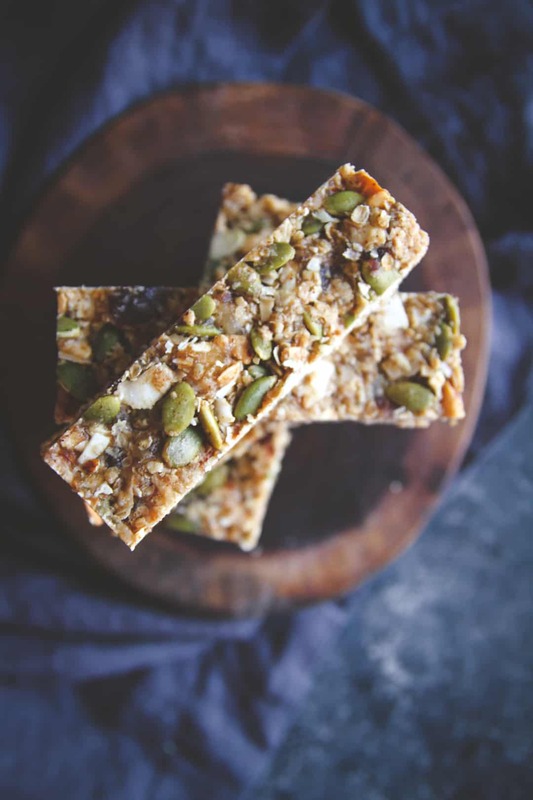 These granola bars will not only satisfy my sweet tooth but give me an energy boost too! I’m hoping to make a big batch of these before my snowshoe trip in a couple of weeks! Yum!!! Thank you so much Christina! 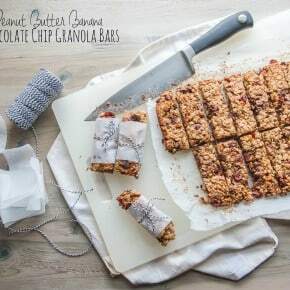 And I hope you love these homemade granola bars as much as I do, they’d be perfect for a snowshoeing trip!